Most modern marketers agree that 'Content is King' but too often the strategy behind content production is neglected and very scatter gun in its nature. I have spent too much time speaking with marketers about 'content marketing'. I have attended conferences specifically on the topic. I have debated at length about the definition and the allocation of time businesses should give to the activity. At every step of the way, it seemed to me that marketers were missing a crucial part of the puzzle - The Awareness Ladder. 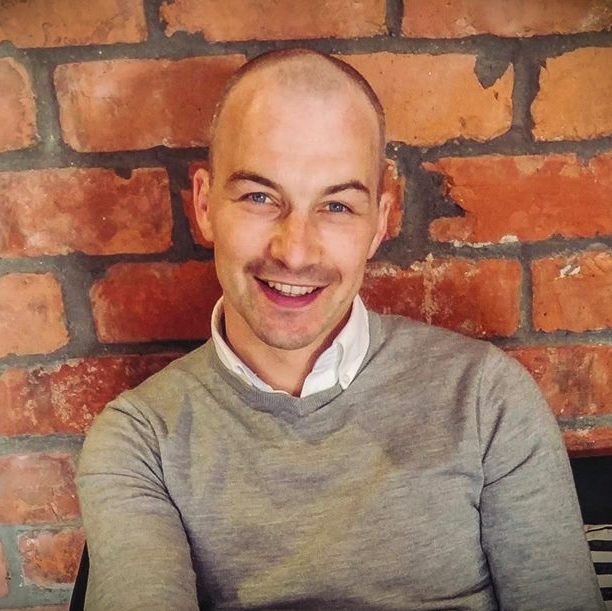 "In order to offer people the right proposition, it is important not only to segment them by their need but also by their level of awareness" Ben Hunt - Convert! What is the Awareness Ladder? First off, I must be clear that this is not my concept. Credit goes to Ben Hunt - The author of a book called Convert. I read this book a few years ago now and I am a big fan and would highly recommend it to all marketers. 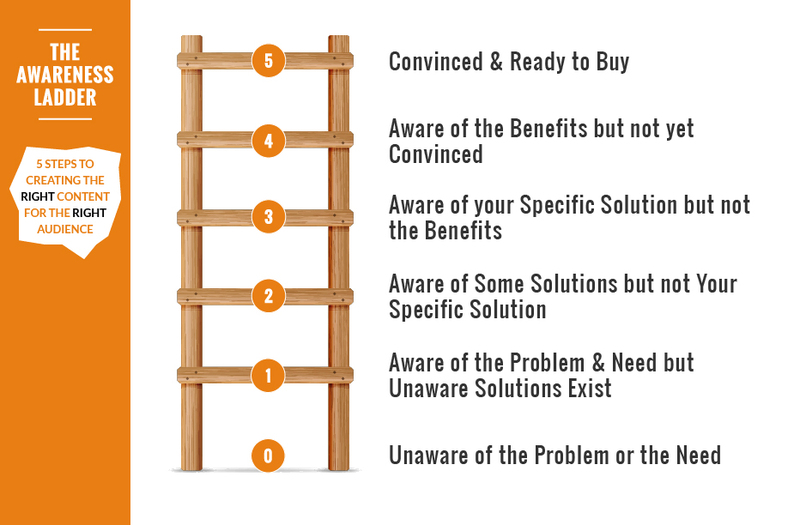 The awareness ladder is a tool that provides you with a clear understanding of what stage your target audience is at in the buying process and therefore what kind of questions and problems they have. The ladder has 5 steps and each step describes a different level of understanding and awareness. The Awareness Ladder applies to all businesses in all industries. If you happen to be a well known household brand, it is likely the majority of your audience is sitting around steps 4 & 5. This is because they are very aware of you but may still need some convincing that you are right for them. If you are a brand new business with a brand new product, your target audience is likely sitting towards the lower half of the ladder. So, once we understand where our target audience sits on the ladder, we can market to their current level of awareness. Let's take a look at how you can market to each step on the ladder - assuming you have done the market research and know who your target audience is. Step 0 (Not even on the ladder) - Prospects are unaware they have a problem or need. How the hell do you market to people who don't have a need for your product or service?? This is the hardest level to market to. It is very important to understand that every customer you have ever had or will ever have has been here at one time. This is the place prospects live before they even realise they have a problem. I think it's kinda spooky that we are aware of these people long before they even have a need for our product or service. As they don't even have a need/problem yet and therefore they are not even looking/searching for anything, search marketing is not an option. This is going to be an education exercise and if done wrong can be hugely expensive. The job here is to convince the prospect that they have a problem. The only way to do that, is present it to them. Where do you do that? In a place where they already go. I would say Facebook Ads or other traditional media are likely candidates as this is where your audience maybe already be spending their time. This is the step focussed on problems and where your website content becomes crucial. When the audience are aware of a problem, search marketing becomes an important consideration for you as a business. Think of your prospects problems and create pages and pages of content that confirm their problem and that discuss it at length. Perhaps even validating their concern by giving examples of others with the same problem. Place yourself in their shoes and think about the problems they would want to read about. Get writing about those problems. The content you create will likely finish by trying to lift them up the ladder - The awareness that solutions to their problem do exist. Similar to step 1, your activity should be focused on creating content to answer the questions of the prospect. However, the content should make the assumptions that the visitor is already convinced they have a problem and they are now looking for solutions to that problem. The content should be focussed purely on the solutions that you provide to their specific problem. Again, search marketing plays an important role here. Keyword research is crucial to understanding the types of solutions people are looking for. It will inform, direct you and almost definitely spark ideas for new content in other areas. The prospect is now aware of your particular solution and your job here is to convince them of the benefits. Creating content that clearly states that your product or service does solve their problem. Show them the dream! Once the prospect understands the benefits of your solution, you must show them how it changes their lives and what life looks like once they have purchased your product or engaged your services. Imagery, testimonials and press articles often play a key role at this stage. Positive third party recommendations can only push people up the ladder. However, be aware of negative testimonials. They are lethal and can throw someone back down the ladder in what my gran would call a jiffy. This step is the holy grail. If you are landing traffic at this level, you are doing a lot right. People are looking to convert at this stage and your job is to provide them with an experience to do just that. Don't make it difficult for them and make sure the actions you want them to take a clear and simple. Marketing for these people is pretty straight forward. 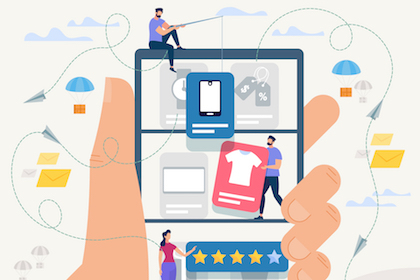 Your marketing should focus on the business name, the product/service you are offering and the clear message that the user can convert easily. Which steps are your perfect prospects sitting at? Start with them then make sure you are catering for as many steps as possible.